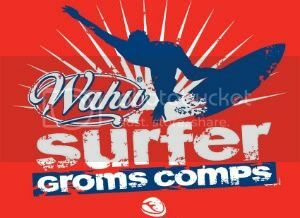 Wahu Surfer Groms Comp Gold Coast round runs December 11th and 12th. Jayden Hawkins, Eli Carr, Luke and Zak Condon are in the event. Good luck groms. In the under 15's Jayden was unlucky not to make the quarters. Eli surfed well and finished 9th. Well done Luke and Zak both finishing in 7th.